TORONTO—There is a stark moment in many Iranian films. It comes at the very end, when the screen goes black and the credits should start to roll, but they don’t. They can’t. These films are made surreptitiously by those who speak truth to film projector. These are actors and directors who face prison or worse because they show things that are not to be shown. 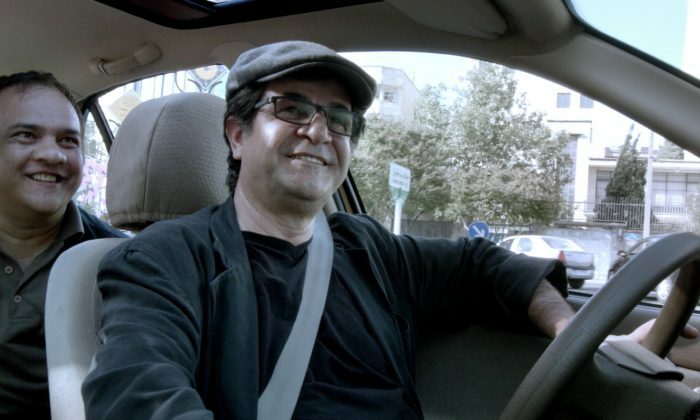 “Jafar Panahi’s Taxi” is one such film, and it is done with skill and alacrity. Made by the famed Iranian director Jafar Panahi, “Jafar Panahi’s Taxi” is a statement disguised as reality TV—an unsanctioned film made in a country with written and unwritten rules on filmmaking that audiences are schooled in by Panahi’s precocious niece. At least she plays his niece, but her real name remains a secret. The only person to be named and known in the film is the taxi driver, Panahi. It’s a unique take on filmmaking, almost like a version of “Cash Cab,” if you’ve ever seen this particular low-budget game show. But this is done masterfully. Panahi is one of Iran’s most celebrated filmmakers, though he isn’t supposed to be making films anymore, we learn. Beginning with what seems to be uncertain jest, we move in a yellow cab fit with cameras to capture its passengers and driver. What unfolds is an almost Forrest Gump-like series of coincidences that lead us toward an understanding of what it means to be a filmmaker or a criminal in Iran, and just what exactly Panahi himself thinks about that situation. The statement this film makes is not subtle, but it is well done. We meet those who make their living smuggling film and music, turning a dangerous profit from trade in censored products like the fifth season of a popular American drama. This is a movie built around dialogue and small events that all serve to convey a much larger picture. Through Panahi’s taxi passengers, we learn what life is like in Iran today. How a wife has little rights to her husband’s property should he die and his brothers lay claim to it. How a mugger outraged about thieves sees no irony in wishing them executed, ignoring the extreme violence of their punishment. How a man who has been mugged can’t bring himself to turn in the perpetrators, though he knows who they were, because he had learned of their desperation and knows they could face death. And we learn that Panahi has been officially banned from making movies, hence the pretext of a reality-type film—just a random series of passengers and events playing out in a taxi cab outfitted with cameras as a security feature. There are moments the cameras look beyond the taxi, and we do see something of the larger world outside the car, but this is a movie built around dialogue and small events that all serve to convey a much larger picture. And this is the beauty of Iranian films and Iranians themselves. They live in one of the most repressive countries in the world, with the world’s second highest execution rate, and still defy the government that has claimed so many of their fellows. There is a moment in the film when a passenger, a female dissident, speaks of a mutual friend on a hunger strike in prison and how this friend’s parents begged the prisoner to break her fast. “You and I have been on hunger strike ourselves; it’s always our very last resort.” the woman says to Panahi. This woman was a lawyer who has been banned from work. The bar association did not protect her. But there was one group she could still rely on—the same group as Panahi himself. She looked at the camera and placed a flower on the dash before it, an offering to audiences around the world hearing of their plight. “This is for the people of cinema, because the people of cinema can be relied on,” she said. And they can be. Every person who sees this film will realize that Iran is not a monolith and whatever threats or violence its regime may wage it does not reflect the Persian people themselves—people with free minds who would risk so much so the world could see their true situation. And all through an 82-minute cab ride.